Hideji Konohanasakuya is a 6% speciality grain beer from Miyazaki Hideji Beer, based in Miyazaki, Japan. It’s part of their seasonal line up. The name roughly translates to “this story” and Miyazaki Hideji Beer used sake rice and yeast used in sake brewing to make this beer. It’s also part of a collaborative effort with local sake breweries in the Miyazaki area too. 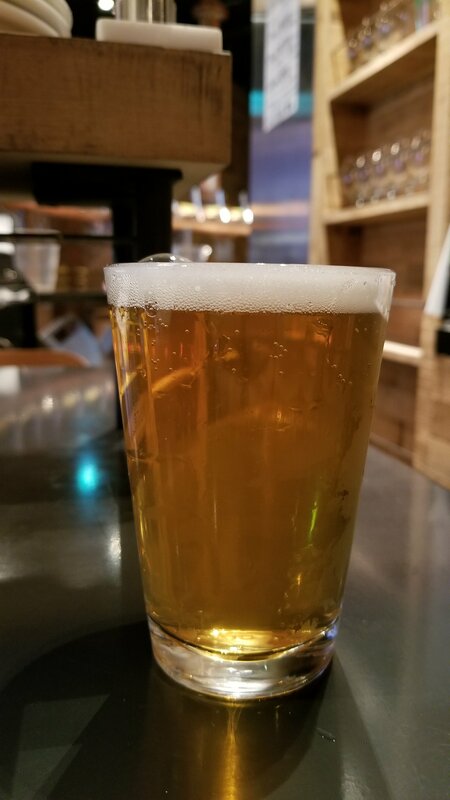 Hideji Konohanasakuya – once I had got my tongue around the name – was ordered as soon as I saw it on the menu at Craftsman Yokohama, mainly because I seldom come across new beers from Miyazaki Hideji Beer on tap. Hideji Konohanasakuya came up a clear golden straw colour with a smidgen of pure white head on top, which was made of large white bubbles. The bubbles popped fast to leave a fruity, yeasty aroma on top with some hints of rice and sake. The hops, if there were any, were either added for bittering or too late as the were hidden by the biscuit tinge and sake kick. The musky banana flavours in the body permeated through the sake like taste. Yet there was no clove kick so Hideji Konohanasakuya is not a weizen by any means at all. It had a subtle lingering fruity aroma to it that faded once it had been noted. It finished off with the sake yeast leaving an fruity sake edge to it that had the merest of dryness to it. I liked Hideji Konohanasakuya as it’s something different from Miyazaki Hideji Beer and worth trying.